How can we remove the 'billing' address option when in the checkout steps. We would like it so that the customer ONLY has to input their shipping address. No 'billing' address required or visible in the checkout process. What version of Kentico are you on? I think pre-10 versions require there be a billing address no matter what, what we have done in the past is set a Global Hook and manually create the billing/shipping addresses upon creation (so catch when an Address is created, and if it's a shipping then create a billing for that user). Same thing happens during checkout: the customer has to enter address anyway so you must have a step with an address, but you just need to set AddressIsBilling, AddressIsShipping to true at the back end. 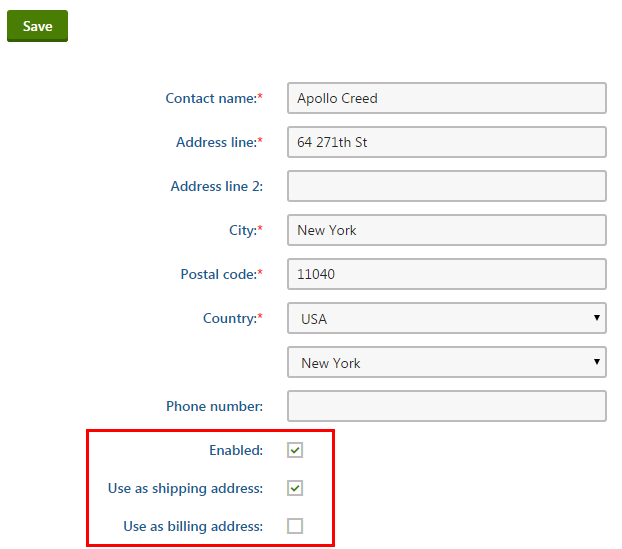 In the checkout process you have "Billing and Shipping Address" step where you are using the same "customer address" web part. Edit this step, change titles, remove checkbox "My shipping address is different from the billing address" and you good to go. P.S. You can use 1-step checkout process if you looking for simplicity. E-Commerce site example has both check out processes (1-step and regular checkout). You can install and do some experiments there. We have Kentico version 7. Would this still work on our version or is there an alternative method?